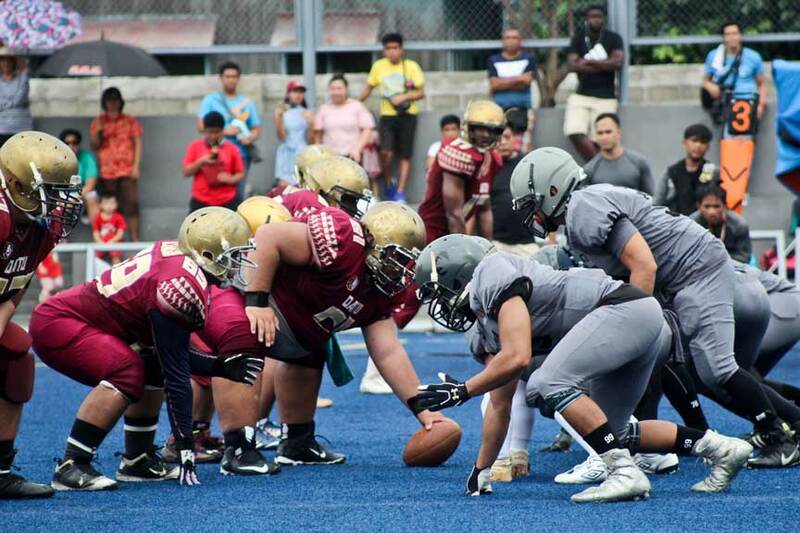 Makati City – The PAFL held its semi-finals last November 5, 2017 with the top 4 contenders. The first game was between the 1st and 4th seeds – the Wolves and Warriors respectively. The Wolves started the game at midfield with run plays and pass plays. The Warriors got their first penalty with an encroachment call. A catch was caught by Wolves tight-end Martin Antonio in the red-zone. The pack scored a touchdown as their quarterback, Luke ‘Zman’ Zetazate, ran the ball to the end zone. The game continued with the Warriors committing errors and giving their opponent more advantage because of penalties. 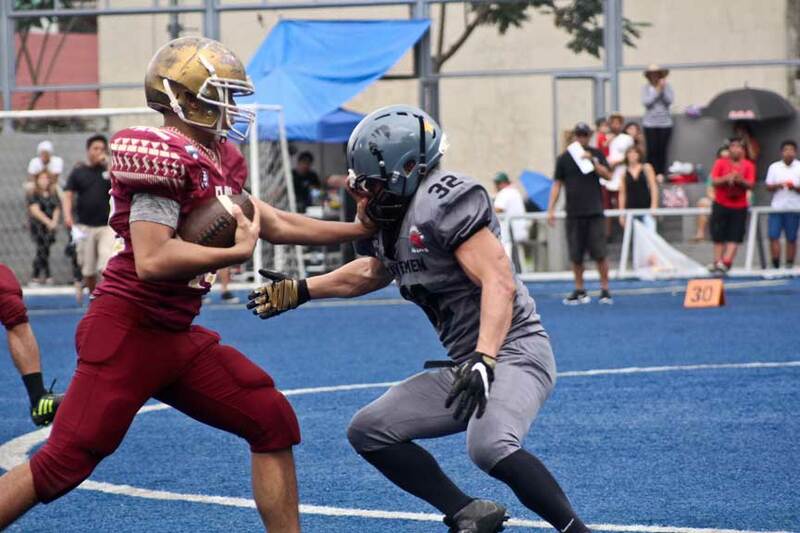 The Wolves continued to dominate with a touchdown to Wolves wide receiver, Migs Dela Peña. Gawin Campbell, Wolves free safety and defensive coordinator, led the defense and caught an interception, which was then converted into a touchdown by Antonio [Wolves TE]. The Warriors’ offense made it to the red-zone at about the 9-yard line. 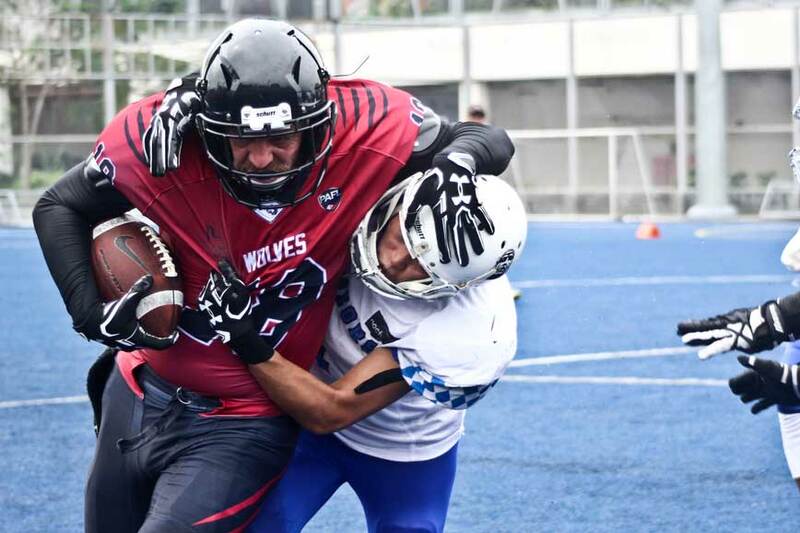 However, Wolves outside linebacker, Darwin Gonzales, forced a fumble on the offense and the ball was recovered by Wolves middle linebacker, Kevin Cederquist. The ball was in possession by the Wolves but was intercepted by Warriors defensive back Jonathan Cappal. The interception was voided due to an off-sides call on the Warriors’ defense. 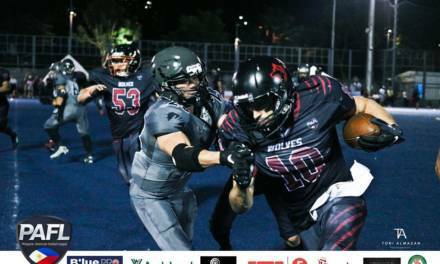 The Wolves repeated their third down with less than a minute left in the first half but was unable to score more points for the remainder first half. The first half ended with the Wolves leading at 28-0. The second half started off with the Warriors making it to the red zone. 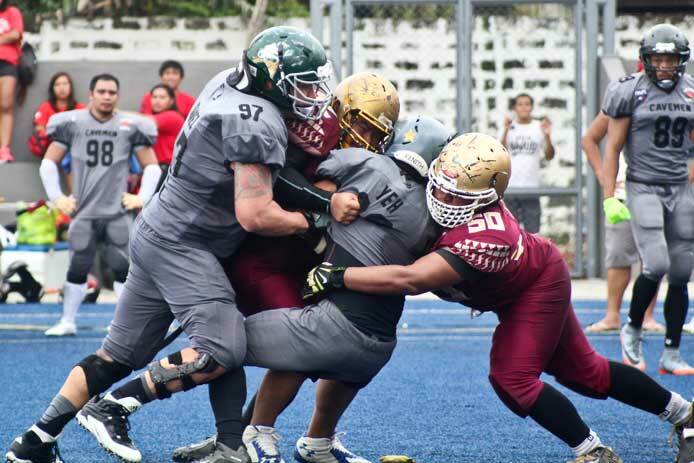 The Wolves defense did not ease down on their game as one of their defensive ends, Jay Viernes, sacked Warriors quarterback, Kenneth Del Santos. 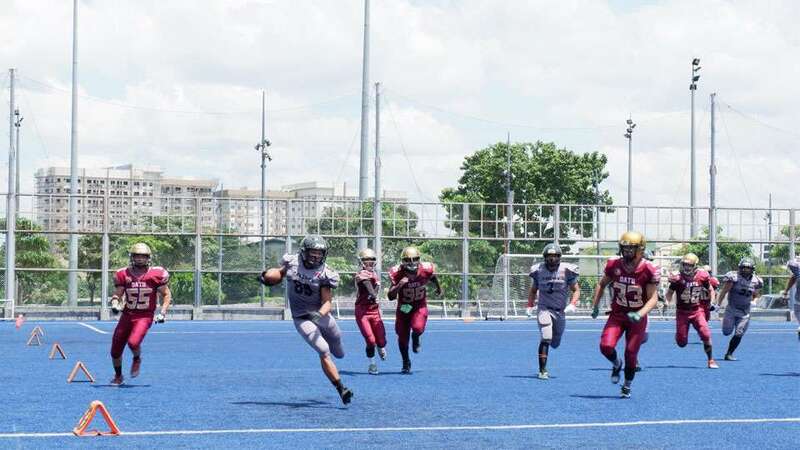 The Warriors of Olongapo made a comeback with a touchdown by receiver Raph-el Allanigue followed by a two-point conversion by Joel Catayong. The score was at 28-8. Both teams used their timeouts early in the second half. The Warriors’ offense was on a roll until Wolves cornerback, Pete Macaranas, bagged an interception. 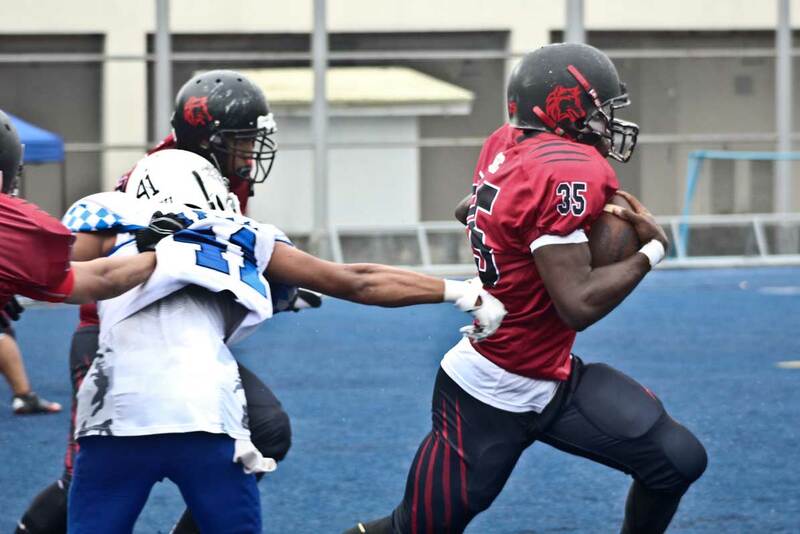 Wolves running back, Cleopas Beutec, scored a touchdown on a 60-yard run. The pack made numerous errors in the 3rd quarter which gave the Warriors yardage. However, the Wolves’ defense made it difficult for the Olongapo-based team to score more points. Early in the final quarter, the Wolves’ defense used their last timeout of the game. Cappal [Warriors DB] was able to cover the pack’s receivers which led to them [Wolves] running the ball to get the first down. A pass to receiver Joshua Gaita resulted in a touchdown. With 10 mins left in the game, Del Santos [Warriors QB] ran the ball and got the first down. They utilized their run plays which gave them an advantage on the Wolves’ defense. 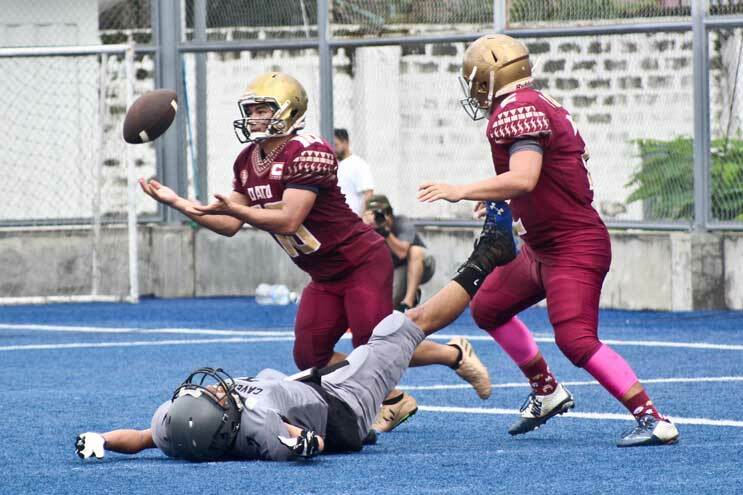 They gained yards with their screen and pass plays but the Wolves’ defense adjusted as defensive end Patrick Gunnacao sacked the Warriors’ quarterback. With 1 minute left in the game, the Warriors surprised the crowd with another interception by Cappal. The Warriors gave their best with their limited time to gain more points. However, with 15 seconds left in the game, Cederquist [Wolves defense] made an interception, a run to the end-zone, and the team’s final touchdown. The final score was 48-8. The second game was between the 2nd and 3rd seeds – The Cavemen and The Datu respectively. The game started off with the Datu on offense. The Cavemen defense gave the Datu offense a hard time gaining yards whether it be runs or passes. A false start was called on Datu early in the game. They eventually had a turnover for loss of downs. The Cavemen offense gained yards and their first down with run plays. Will Yeh, Cavemen running back, got another first down for the team but were unable to score a touchdown. A holding violation was also called against the Cavemen. Aaron Velasquez, Datu running back, got a first down for the tribe. The offense continued to gain yards but was penalized due to a holding violation. The tribe’s wide receiver, Ian Lim, caught the ball with a 42 yard gain. A facemask was called on the Cavemen defense which gave the tribe a 15-yard penalty and an automatic first down. Datu wide receiver, Gio Vergara, caught the ball and was taken down at the red-zone – 4 yards away from the end-zone. At this point, the 1st quarter ended with no scores from either team. The 2nd quarter started off with an unexpected turn of events. The tribe, 4th down and short, was unable to score as the Cavemen defensive lineman Eric Tuazon intercepted the pitch, ran the ball across at 95-yards, and scored a touchdown. 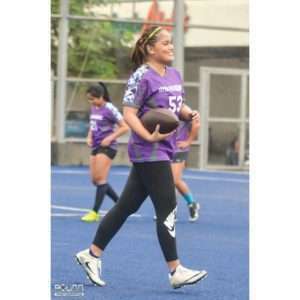 The conversion was then intercepted by Datu cornerback Kane Alferos but was taken down midfield by Yeh [Cavemen RB]. The tribe turned to receiver Laurence Rose for their receptions. Cavemen defensive lineman, JP Suarez, forced a fumble which was also recovered by the defense. The Cavemen got their first down from a hand-off. The pass play, however, was intercepted again by Alferos [Datu CB]. Lim [Datu WR] gained a 21-yard reception. He was able to catch the ball again at 20-yards with 50 seconds left in the first half. Velasquez [Datu RB] ran the ball to gain yards. Unfortunately, just before the end of the first half Datu quarterback, Wewe Alvero, was sacked by the Cavemen defense. The score at this point was 6-0 in favor of the Cavemen. Both teams had a number of errors during the first few minutes of the second half. Velasquez, who also played safety, was able to make a tackle on one of the Cavemen receivers. Yeh dominated the Cavemen’s offense as he gets multiple first downs. The tribe’s offense took advantage of Velasquez’s speed as they used more run plays during the fourth quarter. He also assumed the position of quarterback to make trick plays to gain more yards. The game ended a little while after the 2-minute warning when the Cavemen decided to take a knee. Both teams showed skill on both offense and defense forcing turnovers and incomplete plays on each other. The final score was 6-0. 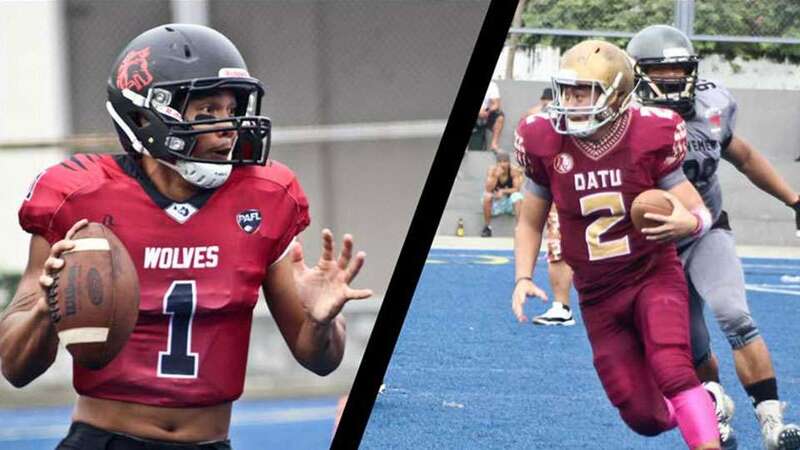 The Cavemen, which consists mostly of Rough Riders [PAFL Season 1 Champions] will face the Wolves for this season’s Championship. Will the Wolves end this season with a sweep and become PAFL champions? Or will the Cavemen, the rookie team of the league, dominate and earn their first championship? 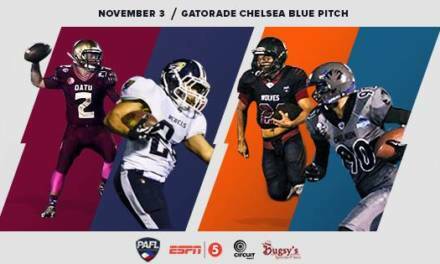 Watch the Championship live at Circuit Makati Blue Pitch on November 19, 2017. Gates open at 9 am. Admission is 100php. We’d like to thank all the supporters who came out to watch the games live.